The elder Moltke has always been portrayed as the nearly-infallible victor of the Prussian wars in 1864 against Denmark, 1866 against Austria and 1870-71 against France: a brilliant, innovative planner and master of the battlefield. The Moltke Myth: Prussian War Planning 1857-1871 shows that this accepted wisdom is based on simplistic generalizations, German nationalism and hero-worship. It subjects Moltke's plans and orders to a thorough critique: "common knowledge" is replaced by attention to detail and a militarily professional description and analysis of Prussian war planning and combat. The emphasis in The Moltke Myth is on the factors that are actually important in military operations: training, weapons, and doctrine, and not on one man's supposed genius. Moltke's war planning and battlefield command turn out to be very far from the thing of wonder that they are commonly made out to be. 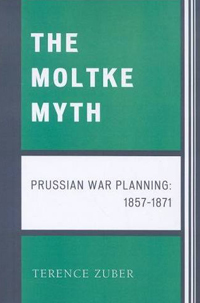 The Moltke Myth: Prussian War Planning 1857-1871 (University Press of America, 2008) 331 pages, 21 maps, index.